Part of Tangelwood's luxurious Sundance Series guitars, the TW73 is a expertly crafted parlor guitar, ideal for the troubadour on the move. 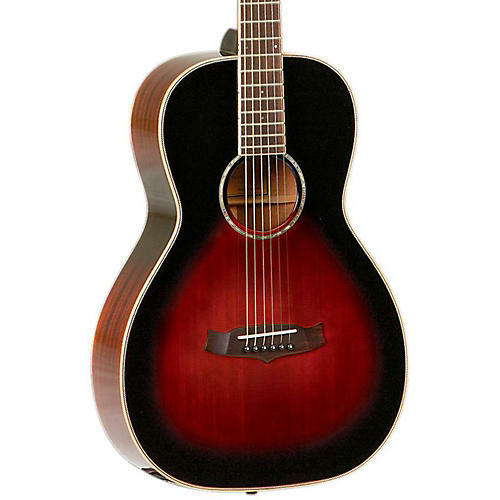 It has a solid cedar top for a shorter break-in period, and solid mahogany back and sides for a warmer and rounder tone. It also features a one-piece mahogany neck with volute that not only gives it a touch of style, but more importanttly will help keep this guitar lasting for years. Other appointments include maple with herringbone binding, open gear tuners, a bone nut and saddle, and a vintage sunburst gloss that really brings out the dark red hue of the cedar.